On the fourth Thursday of November, Thanksgiving, people come together to share gratitude and thankfulness. The next day — Black Friday — many head to shopping malls and department stores to kick off their holiday shopping. On Monday, also known as Cyber Monday, people surf the internet for the best deals at their favorite online retailers. For some, that’s it. 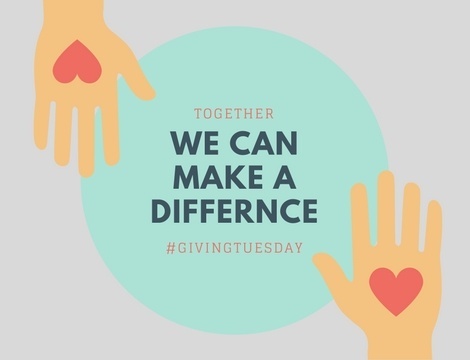 But for others, the biggest day is yet to come: Giving Tuesday. Everyone at The Mesothelioma Center is dedicated to giving back to the mesothelioma community throughout the year. We don’t wait for a single day, but rather we try to make a difference year-round. Every day, our team at The Mesothelioma Centers helps mesothelioma patients and their loved ones find the resources they need to battle the rare, asbestos-related cancer. To do this, we support organizations and charities around the world, aiming to improve the lives of those in the mesothelioma community. This year, we’ve focused on giving back to researchers and specialists extending the lives of mesothelioma survivors through sponsoring events, creating grants and joining prominent organizations. Various organizations host events with the goal of bringing together the mesothelioma community. By sponsoring symposiums and awareness initiatives, The Mesothelioma Center aims to improve awareness about mesothelioma and the dangers of asbestos exposure, increase education about the latest treatment options and clinical trials, and grow funding for mesothelioma research. The Mesothelioma Center at Asbestos.com was a Gold Sponsor for the Pacific Mesothelioma Center’s 6th annual 5K Walk/Hike for Malignant Pleural Mesothelioma. The family-friendly event took place in October with the goal of raising money to find better treatment options for malignant pleural mesothelioma. The event raised a record-breaking $160,495 for mesothelioma research. Just this month, our Medical Outreach team attended the 8th annual Navigation & Survivorship Conference hosted by the Academy of Oncology Nurse & Patient Navigators (AONN). In addition to attending this prestigious event, we sponsored the conference as we know how important it is for patients to have the support resources, including patient advocates, patient navigators and social workers after a cancer diagnosis. The American Academy of Thoracic Surgery (AATS) is an international organization comprised of cardiothoracic surgeons from around the world. Every year, AATS hosts an annual meeting to share the latest information about thoracic surgery. We sponsored this year’s event, which celebrated 100 years of modeling excellence in Boston. The 7th annual International Symposium on Malignant Pleural Mesothelioma focused on bringing together experts from around the world to share cutting-edge research about the asbestos-related cancer. Led by mesothelioma specialists and sponsored by The Mesothelioma Center at Asbestos.com, along with other organizations, this symposium aims to provide up-to-date information about a cancer that receives far too little attention. In September, Ochsner Health System hosted a symposium focused on the latest information about head and neck cancer and lung cancer. The event included many physicians, including Dr. Brian Pettiford, a renowned mesothelioma specialist. As a sponsor for this event, The Mesothelioma Center was able to promote the congregation of cardiothoracic surgeons and researchers. Any kind of cancer treatment is expensive, but given the rarity of mesothelioma, it can be particularly expensive as patients may need to travel far distances to receive treatment from a mesothelioma specialist. We’ve joined hands with several major mesothelioma specialty centers in order to help patients get the care they need. Our team at The Mesothelioma Center prides ourselves on staying up-to-date on the latest research and treatment options for mesothelioma patients. To do this, we join prominent organizations throughout the mesothelioma and lung cancer communities. As we continue our efforts in the mesothelioma community, we will continue to support people affected by this aggressive cancer. We firmly believe that no one should battle mesothelioma alone, and by being involved and giving back, we can make sure patients have the support and assistance they need to combat this cancer.